A strong coalition of establishment-backed Republicans and House Democrats voted overwhelmingly Tuesday to revive the Export-Import Bank, dealing a defeat to tea party conservatives and Speaker-to-be Paul Ryan. The legislation's fate is uncertain in the Senate. Proponents of the bank forced a House vote through a rarely used procedure known as a discharge petition. They pushed a vote over the opposition of top House Republican leaders such as Majority Leader Kevin McCarthy, Whip Steve Scalise of Louisiana and Financial Services Committee Chairman Jeb Hensarling. But outgoing House Speaker John Boehner was a quiet supporter and did not discourage Republican proponents of the bank from pursuing the petition drive that forced the measure to the floor. Conservative critics say the bank provides too much of its credit assistance to help huge, well-connected corporations such as The Boeing Co., General Electric and Caterpillar Inc. They say the bank finances just a fraction of U.S. exports and alternative financing options are available. "Are we going to reward good work or good connections?" Ryan said. "I think there are plenty of other ways to expand opportunity in this country, and corporate welfare is not one of them." Several companies have announced they have lost business because of the lapse in bank operations and are threatening to shutter plants if it isn't revived. Democrats provided the bulk of support for the measure, another example of them driving the House agenda despite being the minority party. "This is a bill about jobs for small, medium and large businesses. This is a bill about America's competitiveness with the rest of the world," said No. 2 House Democrat Steny Hoyer. A drive by traditionally Republican-friendly groups like the U.S. Chamber of Commerce and the National Association of Manufacturers focused on the assistance the bank provides to small businesses. The Senate voted 64-29 this summer to reauthorize the bank as an amendment to an unrelated bill extending highway programs. Senate Majority Leader Mitch McConnell, however, opposes the bank and said Tuesday that he won't bring the House stand-alone measure up for a vote. "The way to achieve Ex-Im, if it's going to be achieved in the Senate, would be in the context of the highway bill," McConnell said Tuesday. Prospects for the bank aren't helped by the looming departure of Boehner at week's end. 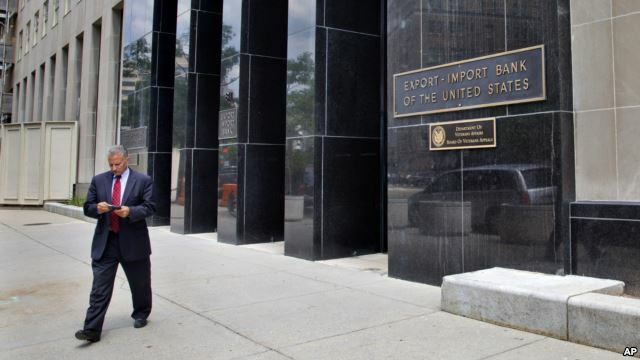 Proponents say killing the bank would put U.S. businesses at a disadvantage with foreign firms that benefit from export assistance from their own governments. But opposition to the bank has energized conservatives who see a rare opportunity to eliminate a major government program. 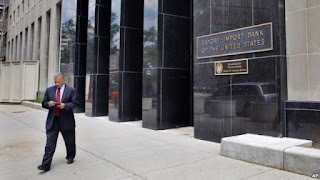 Hensarling resolutely refused to move the measure through the Financial Services Committee, where more than half of the panel's Republicans opposed renewing the Export-Import Bank. Russia says it will likely deplete one of its two rainy day funds by the end of next year as it tries to plug the state deficit amid the economic downturn. 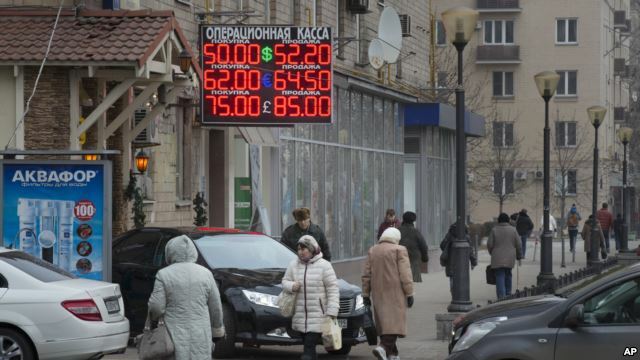 The economy fell into recession this year for the first time since 2009 due to Western sanctions and a drop in prices for the country's crucial energy exports. Personal incomes have fallen for the first time since President Vladimir Putin came to power 15 years ago. Finance Minister Anton Siluanov told the parliament on Tuesday that the Reserve Fund, which holds 4.7 trillion rubles ($74 billion), is likely to halve by the end of the year with oil prices as low as they are. "This means that 2016 could be the last year when we have these reserves to spend," Siluanov said. "From then on, we will have no resources like this." As oil prices began to climb in the mid-2000s, Russia decided to set aside some profits from oil exports into two rainy day funds. The second one, the National Welfare Fund, now holds $4.9 trillion rubles and is largely used to support infrastructure projects. Unlike in the 1990s, Russia is much better prepared for a recession as its debt levels are low and the currency, the ruble, trades freely on markets. The Russian economy is forecast to contract by 3.9 percent this year and grow by 0.7 percent next year. The financial services firm, Alexander Forbes, said more than 40 percent of Kenyans cannot afford to retire and must continue working. The new report shows that another 40 percent rely on family for support. The survey paints a sad picture for of Kenya’s ability to care for its growing aging population. 65-year-old Domnic Ologi runs a tap water kiosk. He spent three decades working in the public and private sector. He stopped working 10 years ago, but he is one of millions of Kenyans who can't afford to retire. "During this times, I had a lot of times in my hands and to supplement what my wife was bringing in I looked at my environment, what my environment was lacking at that time,” he recalled. Ologi, like many Kenyans, has no savings of his own for retirement. He gets 7,500 shillings, about $75, a month from his state pension. Alexander Forbes administers financial and retirement funds in the region. The South-Africa-based firm said Kenya has the lowest mandated pension contributions on the continent, just 10 percent of income. National Social Security covers most Kenyan workers, but the scheme is plagued by corruption and management issues. Officials say contributions are low and thus payouts are low. Workers are resisting efforts by the government to increase the monthly contribution to 12 percent, half from the employer and the other half from the employee. Forbes said nearly half of retired Kenyans depend on family members to survive. Wasonga Jacob, 22-years-old, said he doesn’t have a problem supporting his parents. "Its nature in us as human beings to support and give back where we came back from, because look at it from this angle, they’ve taken care of you since you were young up to now taking you to school. So literally it's socially acceptable or socially moral to give back to mum and dad,” he explained. However, 27-year-old Faith Mutisya said it is a burden. “I get it a bit hard because staying here in Nairobi, [it] is not cheap when it also comes to rent, and you are paying all that pension for me. I pay for three people, [it] is not easy,” she said. The World Health Organization said Kenyans are living longer than they did 20 years ago. That combined with the ongoing population boom in Africa means pressures on the state to provide for the elderly will likely only intensify.